One of the new showings from moton-colortronic at K 2013 is the ULTRACOLOR medical gravimetric batch dosing and mixing station for plastic granules, additives and regrind. As its name told, ULTRACOLOR medical is specially designed for pharmaceutical and medical technology applications, which requires high standards in terms of freedom from contamination, mixing precision and repeatability. Due to the company’s IntelliBlend technology, this silicone-free system offers high dosing precision and dosing consistency. The system is additionally equipped with filterless conveying. The container components are built with electro-polished stainless steel for clear functions in a hygienically clean working environment. With high dosing accuracy and consistency, the system therefore improves end product quality and saves money by using less additives and reducing scrap. It is suitable for direct mounting on small injection moulding machines or extruders. All material components are accurately dosed and weighed one after another into a weigh hopper. They are then passed to the mixing chamber where they are homogeneously mixed. The accurate gravimetric measurement and control of material flow rates guarantees an optimum dosing and mixing. The weighing accuracy is not affected from vibrations caused by the processing machine, as these are filtered out by a special algorithm. The hemispherical mixing chamber prevents dead zones and provides a completely homogeneous mix. As a filterless loader, any dust particles found in the material are sucked with the vacuum air from the loader and deposited in the central dust filter. The central dust filter is located outside the clean room. The GRAVInet control system for ULTRACOLOR medical boasts an Ethernet-based open network architecture. A full color touch-screen enables simple, intuitive, fast and reliable operation. It has comprehensive features for process and recipe management. The control system offers the user reporting and documentation functionality for quality assurance. It also delivers advanced service functions and graphical display of process data. The integrated conveying control saves a separate conveying control in many cases. 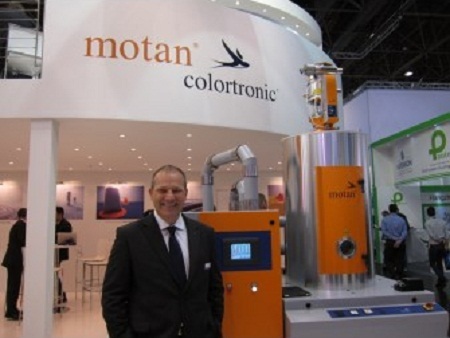 According to Carl Litherland, Vice President, Group Marketing, moton-colortronic, ULTRACOLOR medical is already certified by the US Food and Drug Administration (FDA). The traceability it provides is an important requirement in demanding medical applications.